Schools in built up areas are identified easily by the safety railings immediately outside the school gates. 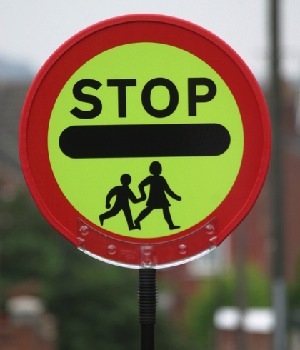 It's fairly common knowledge that these are placed there to ensure that when children leave the safety of the school perimeter fence they do not walk straight out into oncoming traffic. There are some similarities to be drawn in the ways that schools ensure children's online safety while in the school environment. Schools maintain a zone of internet safety by denying children access to blocked sites, eg. Facebook, adult content and by applying filters that actively find and block content that features certain keywords. Simply having a perimeter fence around the school and safety railings are not effective tools in themselves for educating children about road safety, they are merely preventative measures. These measures on their own are not enough, it is highly important that children learn about the risks and hazards so that when they are outside the zone of safety provided by these physical guards, they can use roads safely. The potential distraction is that as we put more barriers and safeguards in place around the provision of internet in schools, we overlook the unfettered access that our children have to content outside this environment. We perhaps fall into the trap of believing that our children access the internet in a zone of safety, but this is an illusion. A balance needs to be struck between putting physical limits in place and educating the children so that when those limits are not in place they don't go on an unfiltered binge. Parents can easily forget that the smartphones children carry around in their pockets have unfiltered access to the internet 24-7. Trying to put any effective limits or filters in place on the child's own smartphone can present a real challenge. There is also the potential danger that a parent will believe that the measures and safeguards in place are 100 per cent effective, resulting in a misplaced trust in the technology. Children are unlikely to understand why the safety railings are in place outside the school gates without any explanation. In as much as the safety railings don't actually teach children about the hazards of crossing busy roads, internet filters and blocks do not alone teach them how to browse safely on the internet. I would advocate that we should instead listen to our children's own perceptions and concepts of e-safety and after listening seek to shape their impressions in the direction of clearer understanding of safety and where the risks lie. When we tell our children not to use a particular site, app or social networking tool – how do we know that they will abide? Some parents insist on being accepted by their own children as friends on Facebook on the expectation that their child would never post anything that they would not approve of. As our children rush to share their real world lives online through the growing plethora of social media apps, it is important that teachers and parents don't place too much value on purely physical barriers to protect the safety of our children online. We may not remember how our parents first carried us across the road, then held our hand and later as our parents' trust deepened they allowed us to cross on our own. It is far wiser to place greater emphasis on educating our children about e-safety, than legislating for it. How do you manage passwords with primary school children? It’s a dilemma. More and more of the work we do now in class is online. This could be an online cloud such as Google Apps or Microsoft 365, it could be a VLE or their email, or it could just be a simple website like animoto.com where they create photo galleries. The truth is that there are so many potential usernames and passwords that it is obvious that for many users, teachers as well as children, they will find one password and stick to it. So let’s assume that the majority of users in your school have a single password. We can pretend that most of them have a different password for every tool, but it just won’t be the case. So is that single password secure? How can we make it a good password? How can we check that our password is good enough? Luckily there is a free website called How Secure is my Password that gives a rough indication of the strength of a password. You simply type a password into the box and it will change colour to hopefully orange or better yet, green, if the password is secure. It is a great visual way of seeing the effect that adding a number or character can have on a password. 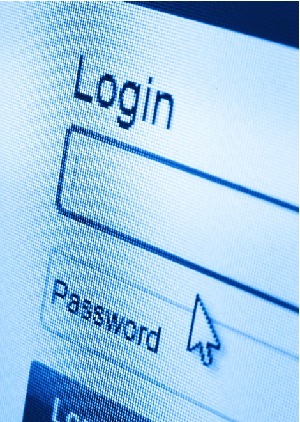 Password advice often suggests using a mixture of upper and lower case letters, numbers and punctuation. There is also the idea of changing letters for numbers so even the humble password could become Pa55woRd? And this then becomes harder to crack. Of course it also becomes harder to remember too. When it comes to actually choosing a password to remember, one great tip for younger children (probably around Year 3) is to pick two unrelated words that they can spell such as house and flower. On their own, they could both be cracked by a computer instantly but together they would take 10 days. Better yet, by making the first letter a capital (Houseflower) and that ‘score’ jumps to 59 years. But there is much more chance of a child remembering that password than there is them remembering a jumbled-up selection of letters. Although I am sure the site is fine and doesn’t track passwords, I wouldn’t suggest doing it on a personal computer, just in case. You can’t be too careful right? Oh, the example above (Pa55woRd?) would take a year to hack, apparently. Another top-tip is to search online for “top 10 passwords” and there will be a range of surveys and lists giving examples of common passwords. This can then lead into a debate about why these are so common and why they should be avoided. So what seems like a simple task of choosing a password can be used as the starter of a discussion and the stimulus for teaching others. Give it a go, how secure is your password? How can we support e-safety in the classroom? I believe in learning through any means; be that via textbook, tablet, mobile device, etc,. Today’s employers and the wider working culture expect young people to be confident with gathering and interpreting information from a variety of means, and our students are exposed daily to the online world be that friend or foe. As teachers we are in a unique position to deliver online learning and concurrently educate children about e-safety. At Priory School, students take part in e-safety training in Year 7 ICT but it is the duty of every teacher who advocates the use of online learning to embed safety messages in their lessons. It is possible to include subliminal, routine reminders within every subject. For example, in Geography, students are introduced to safe practice in the use of personal information and images when producing videos or writing on our trips blog, as well as via the BBC School Report work. We consistently refer to our ‘mobile@priory’ policy protocol which reiterates the (co-constructed) convention of not using full names or images without permission. 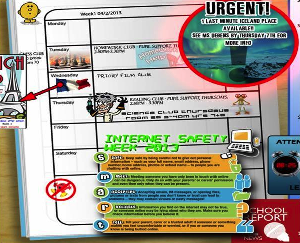 You can see our school desktop in the image, tying in to Safer Internet Day 2013 with useful tips and reminders – a useful tool. I attended Bett last week and enjoyed seminars on online learning delivered by students and professionals alike. Here are some links I believe are worth investigating further. 1) www.thinkuknow.co.uk - The Child Exploitation and Online Protection (CEOP) Centre website has useful tips and tools for parents/guardians and professionals. There are resources available for teachers to aid delivery of e-safety topics. 2) www.saferinternet.org.uk - Contains tips, resources and guidelines. Also well worth following @UK_SIC on Twitter for the latest developments and links to websites / video. 3) daviderogers.blogspot.co.uk - Explore David Rogers’ blog for the mobile@priory story, the cookbook and draft policy. He is pedagogic revolutionary. 4) www.olliebray.com - Two great posts on Internet Safety Day featuring video links on cyber-bullying and child safety. 5) – E-safety videos for primary and secondary schools. Finally, I was introduced at Bett to the work of Catmose College using www.makewav.es/safe. I heard students present very professionally a story of this site which offers a safe online hybrid of social networking and blogs in order to share work / images / video / documents and then to interact and comment – all within a tightly controlled framework moderated by adult staff. For more information see their website or here. As educators, our role with e-safety is not about restriction but about educating young people on the risks, as well as the benefits, of the online world. It is not about scare-mongering but realism, supporting children to develop safe online behaviour in and out of school, in order to become confident users of (not abusers of or abused by) online communities.